All over the world – from the Americas to Europe to the Middle East to Africa and Asia – companies in the Information & Communications Technology (ICT) sector face increasing government pressure to comply with domestic laws and policies in ways that may conflict with the internationally recognized human rights of freedom of expression and privacy. You can read more about the work of the Global Network Initiative on the Berkman site and the statement of principles that they’re working from here. This commitment in the GNI is a big step. The principles call on groups to affirmatively protect users rights to free expression and privacy even when confronted by government pressure. Moreover, the stakeholders include a broad array of major players in the information infrastructure, including Google, Yahoo, and Microsoft. Only time will tell how this declaration plays out in practice as governments increasingly attempt to shape the online space, but for now, it looks like a line has been drawn in the sand. I’ve been lucky enough to be part of two great conversations at Berkman today, which both boil down to increasing the number of voices on the Internet and in the technology field. Ultimately, we can’t have a liberal networked public sphere anywhere in the world if rich white guys in urban areas (the coveted ‘latte drinking pansy’ voting bloc) are the dominate group in every conversation. First, I sat in on a meeting of the gender and technology group at Berkman which is asking what I think is a difficult but important question–why are women so underrepresented in the technology field and on the Net. As our blog research has shown, women are certainly blogging less than men in Iran, Russia, and the Arabic blogospheres. Check out the group’s blog and facebook group–and hopefully an event on the topic is coming soon to push the conversation forward. Seems like there isn’t enough research in this area either. Second, David Sasaki from Rising Voices spoke today about efforts to increase the number (and quality) of underrepresented groups in online conversations. David showed some great videos from African bloggers and also discussed the micro-grants they are giving for citizen media training. He mentions how much demand there is now for this type of training, which was funded by a Knight Challenge Grant. He shared some great examples of what participants have done as part of the project–one of my favorites is a teacher blogging from the smallest school in the world–a 4 student school in a remote Iranian fishing village. On the site I also discovered Iran Inside Out, a great video project. In many cases this type of work allows us a better, unfiltered view of countries like Iran that are either ignored by most traditional media, or only discussed in terms of the nuclear issue or other limited frames. John Kelly and the other brainiacs over at Morningside Analytics have created a great new political video barometer at Shifting the Debate. Using link and social network analysis of the US blogosphere, similar to what we used for our Iran blogosphere study, you can see what the most popular videos in both the US conservative and liberal blogospheres are, how long they have been around, how many bloggers link to them from each side, as well as how many folks have viewed each clip. It’s updated every six hours, you can also see how certain videos rise and fall over time. For example this clip of the old ‘wassup’ crew appears to have emerged in just the last day but is already the most linked to video on the liberal side (I have to admit, I was living overseas when this ‘wassup’ ad was a thing so probably don’t get the cultural references others might, but still enjoyed it). On the conservative side, the most popular video is of McCain at the Al Smith dinner (via Fox News), which has been around for a bit longer and is therefore a darker hue of orange–I think all sides agree he was funnier than Obama and is worth watching if you haven’t seen it yet. And smack in the middle is c-span’s coverage of the last debate. We’ve been doing more blog research with John on election blogs as well as Russian and Arabic blogospheres. Look for updates on those research efforts this week here on the Internet & Democracy blog. In the mean time, you can play with the political video barometer. Super interesting op-ed piece from Larry Lessig coming in this week from the New York Times on the extent to which the Digital Millennium Copyright Act (DMCA) is being increasingly used this election season to stifle political speech and debate. In his usual style, Lessig’s got some solid arguments about the extent to which the extremely strong provisions of the DMCA are being used to presumptively block content online which would be better protected under fair use. After all, a 95-year copyright on “Wall-E” may encourage Pixar to make innovative movies, but we can be confident our presidential candidates don’t require any first-to-the-market advantages before they agree to debate, nor is there a need to protect their answers as though they were record albums or new technologies. Amusingly, even in cases in which the DMCA is not explicitly used as a tool for censorship, the unwieldy nature of the copyright regime continues to inhibit political speech and discussion. This has even tripped up the campaigns themselves, with the McCain campaign facing several takedowns of their videos after using clips from a CBS newscast. Their proposed (later rejected) remedy to gain special fair use privileges with regards to the law seems unfair in light of similar problems which have plagued regular users. As Zittrain’s pointed out, the extent to which the Internet ecosystem continues to move towards a dense field of tethered wep apps and applications powerfully supports these kinds of activities, since it becomes possible for the owner of a system to remotely (and, sometimes, automatically) remove content en masse. However, the root of the problem here isn’t technological — indeed the law enables the kinds of censorship activity which leverages tethered services in precisely this way. In the end, any solutions that aim to merely tweak the digital environment will only treat the surface symptoms of the problem: it seems clear that fair use needs to be more strongly defined to more fundamentally secure civic engagement on the Internet. Yochai Benkler gave a talk today in reception of his appointment as the Jack N. and Lillian R. Berkman Professor of Entrepreneurial Legal Studies at Harvard Law School. Jack Berkman (now deceased) is the father of Myles Berkman, whose family endowed both the Berkman Center (where I am a fellow) and Benkler’s professorial chair. His talk was titled “After Selfishness: Wikipedia 1, Hobbes 0 at Half Time” and he sets out to show that there is a sea change happening in the study of organizational systems that far better reflects how we actually interact, organize, and operate. He explains that the collaborative movements we generally characterize as belonging to the new internet age (free and open source software, wikipedia) are really just the instantiation of a wider and pervasive, in fact completely natural and longstanding, phenomena in human life. This is due to how we can organize capital in the information and networked society: We own the core physical means of production as well as knowledge, insight, and creativity. Now we’re seeing longstanding society practices, such as non-hierarchical norm generation and collaboration more from the periphery of society to the center of our productive enterprises. Benkler’s key point in this talk is that this shift is not limited to Internet-based environments, but part of a broader change happening across society. 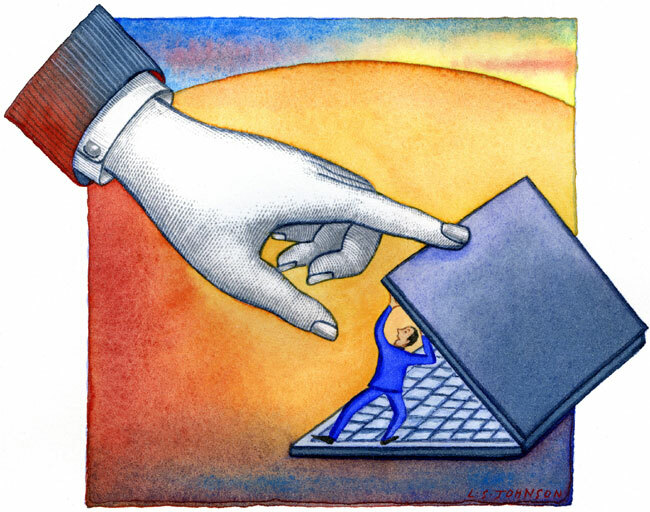 Examples outside the web-based world include GM’s experience with it’s Fremont plant. This plant was among the worst performance in the company. GM shut it down for two years and brought it back 85% staffed by the previous workforce, the same union, but reorganized collaboratively to align incentives. This means there are no longer process engineers on the shop floor and direct control over experimentation and flow at the team level is gone. The plant did so well it forced the big three to copy although they did so in less purely collaborative ways, such as retaining competitive bidding. Benkler’s point is that there is a need for long term relationships based on trust. An emphasis on norms and trust, along with greater teamwork and autonomy for workers implies a more complex system with less perfect control than Hobbes’ Leviathan vision. The world changes too quickly for the old encumbered hierarchical model of economic production. Benkler thinks this leads us to study social dynamics, an open field without many answers yet. He also relates this work to evolutionary biology: from group selection theory of the 50’s to the individualistic conception in Dawkins’ theory of the selfish gene in the 70’s, and now to multi-level selection and cooperation as a distinct driving force in evolution as opposed to the other way around. This opens a vein of research in empirical deviations from selfishness, as a pillar of homo economicus, just as Kahneman and Tversky challenged the twin pillar of rationality. Benkler’s vision is to move away from the simple rigid hierarchical models toward ones that are richer and more complex and can capture more of our actual behavior, while still being tractable enough to produce predictions and a larger understanding of our world. If you’re a political and news junkie like me–and many others here at the Berkman center–then the political blogosphere is a godsend, especially during this election season. While often criticized for being the online equivalent of screaming cable news hosts, bloggers have been way out ahead of traditional media in their analysis of trends and polling data. Bloggers like Daily Kos have actually commissioned their own daily poll and release all of the internals, while traditional media only routinely do a story based on polls they pay for themselves, and don’t release internals. Kos apparently decided to commission his own poll so that he could see all the poll data, and, more importantly, release it on the Web for everyone to see (talk about taking on a role traditionally left to mainstream media, and doing it better and faster). As Election Day approaches, there are now so many polls it can be tough to keep track, but luckily Polster.com‘s ‘roll-up averages’ of all the polls helps, and they’ve also got state by state poll results. And tracking all this data has led me to what seems to me the best polling blogger out there–Nate Silver at fivethirtyeight.com. 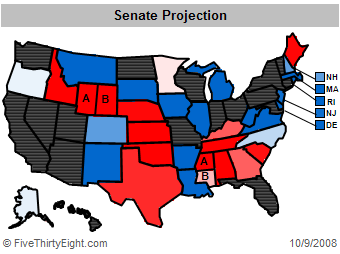 Tons of data, but more importantly, great analysis; including his posts today on ‘undecideds.’ and Senate projections. Amazingly, the site only went live seven months ago and has gone from 80 visits a day to almost 700,000. Of course, what is perhaps most reassuring in all of this from the perspective of this little experiment we call American democracy, is that negative campaign tactics of late are not working in the presidential campaign. 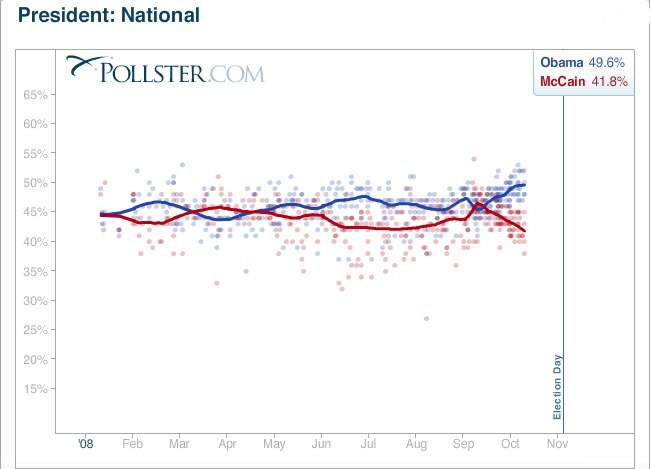 Just check out the trend lines on any of these polls. If there is one thing that turns off voters around the world to democracy, it’s election campaigns without substance, and especially mudslinging and attack ads. Let’s hope both sides pull back from those tactics in the final weeks of the campaign. Can the Internet restore Congressional power? The crisis on Wall Street and subsequent negotiation between the Bush Administration and Congress over solutions expose a dangerous weakness of the people’s branch in the modern era: legislators lack unity and the power that unity affords. They will lose almost every time they get into a showdown with the President, especially without an O’Neill or Gingrich to rally them. The fact that the representative branch of government operates at a disadvantage vis-a-vis the executive branch presents an enormous threat to our democracy. High school civics classes teach that Congress makes the laws and the President enforces them. Americans would be forgiven if they think that it’s the President who makes law and Congress who has the veto power. The Wall Street bailout and the Iraq war resolution illustrate how — in high-profile crises — the Executive branch drives its agenda through Congress due to its superior ability to plan, focus attention, and control national discourse. Often, Congress is relegated to nibbling around the edges or poking holes in the President’s plans. Making the first offer gives the Administration enormous leverage over Congress. In both the Iraq war resolution and the Wall Street bailout, Congress never really questioned the core premise (Iraq presents an imminent threat; the economy will collapse without intervention) nor strayed very far from the proposed solution (invade; bail out). We know, in the case of Iraq, at least, that this is not because the President was right on the merits. Rather, he was simply in the better bargaining position, having “anchored” the negotiation. I wonder if there is one of these for Web traffic? 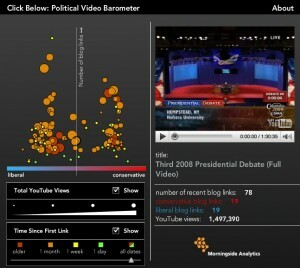 Is the Internet making a difference to the 2008 election? A recent survey by the Wall Street Journal/NBC/MySpace of newly registered voters and lapsed voters has shown that the Internet keeps playing an important role in the current campaign, especially amongst younger people; however, the effect which online news will have on actual voter turnout remains to be seen. Newly registered voters are those who either registered for the first time, or who skipped the 2004 election and have now registered again. The sample is thus overwhelmingly made up of young people (three quarters). These data supports the idea that online social networking sites and Web 2.0 applications are facilitating or enhancing young people’s participation in politics; however, whether this will translate into offline participation is a question which remains to be tested. Offline participation in a rally or demonstration to support a candidate was very low amongst both new voters (5%) and all voters (9%). Similarly, volunteering for the campaign was also pretty low amongst both groups (6% of new voters vs. 9% of all voters). Furthermore, when asked about how interested respondents were about the upcoming election, 49% of new voters said they were very interested compared to 70% of all voters, and only 54% said they will definitely vote. The question which remains to be asked is the following: is online campaigning and activism replacing old fashioned, face-to-face door-to-door campaigning? And if so, is it qualitatively different and what will this mean for the democratic process? Stay tuned. Full report and commentary available here.